There is a help text when you click "log out" in the menu which warns you that it will affect your login on all devices. Even with the warning, this violates the principle of least astonishment, at least for me, and also is usually not the action I would want to take. My primary use case for wanting to log out is if I borrowed somebody's computer, and want to log myself out on that device only. I see no reason why it should force me to authenticate anew on other devices, such as my own phone. The fact that it also logs me out from other sites in the StackExchange network exacerbates the nuisance. In practical terms, it means I will need to resubmit my password half a dozen times when I return to my own desktop computer. Even if this is a conscious design decision, could it be reconsidered, at least to the point of offering a separate, alternative "on this device only" logout functionality? While it may violate the principle of least astonishment, it can be considered a security best practice. Despite all precautions, proper security protocols should assume that your user session is not perfectly protected, which means that some situation could arise that allows your session to be accessed from a device that you don't have control over. This could be as simple as you using your friend's computer, and then failing to log out when you give it back to him, but the realm of session hijacking attacks is diverse and always growing, and Stack Exchange can't assume that they've protected every avenue available both now and in the future. So, if you log out, you log out any active session, which means that any device that had access now requires your password, which is much less straight forward to gain access to. That's the "why". In the absence of more sophisticated control over which devices have an active user session, then that's the best approach. But I agree, providing a more granular interface for selecting certain devices is probably warranted. The default should still be to log out everything, to default to "most secure". Do keep in mind that it's a little harder to identify specific devices by browser vs., say, Facebook, which is typically accessed by an app. So the solution to this problem isn't 100% straight forward, but should be solvable. Not the answer you're looking for? Browse other questions tagged feature-request status-completed user-interface logout . Logout of Stack Overflow on computers I no longer have access to? I forgot to log out from Stack Overflow from a public computer. What now? How do I log out of Stack Overflow? 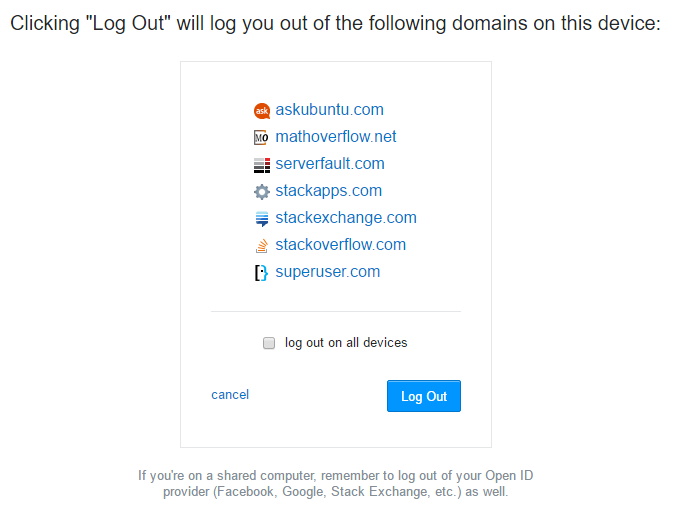 How to log out from Stack Overflow? How do I log out from StackOverflow?